Don’t Stop Believin’ – Trees & Flowers & Birds! What I don’t understand is why the guy writing that article is so shocked that this is the top selling digital song! Why not? As pointed out in the article, it’s made the rounds on the soundtracks of plenty of popular movies and tv shows and as the song for the World Series champion Chicago White Sox in 2005. By far its most famous use though was as the final sounds heard as the epic tv series The Sopranos ended. Consequently a whole new generation of music buyers know it. Of course my history with it dates back to when that video up there was made – live concert in the 80s. I saw them live several times back then. 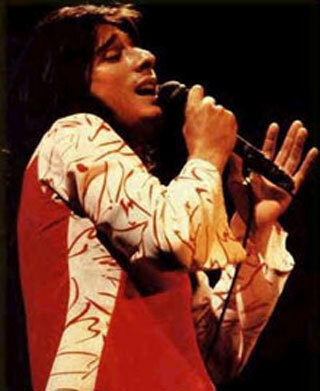 I was utterly in LOVE with Steve Perry. What? Why are you laughing? You don’t find that stunningly large nose attractive? And it’s the perfect tune for this week. To celebrate the victory, but also to keep focused on the fight against prop 8.
i didn’t grow up listening to Journey, not because i didn’t like them, because i didn’t know about them. They have some good music and I really love this song! It was playing at the bowling alley Saturday night and i was just singing away! que lastima que no naci en su decada porque hubiese sido una fans enamorada…estaban bien lindos! !